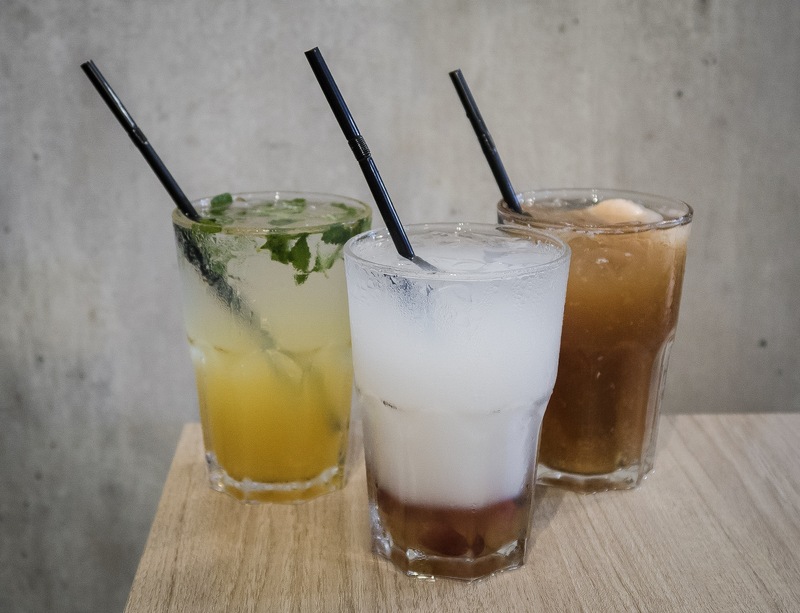 Grub is well known for their cafe in Bishan Park, and now they have a second outlet at HomeTeamNS-JOM. Both outlets serve up good ol’ fashioned western comfort dishes with some menu differences—Grub at Balestier doesn’t serve up pastas. But fret not, it still has a delicious range of burgers, noodles and lunch specials. In celebration of National Day, both outlets of Grub will be launching Har Cheong Gai Waffles ($15.80++). These waffles with a favourite local twist are a definite must try! The chicken fillet is tender and coated with a prawn paste batter that is crisp, and stays crisp even after being out on the table for some time. 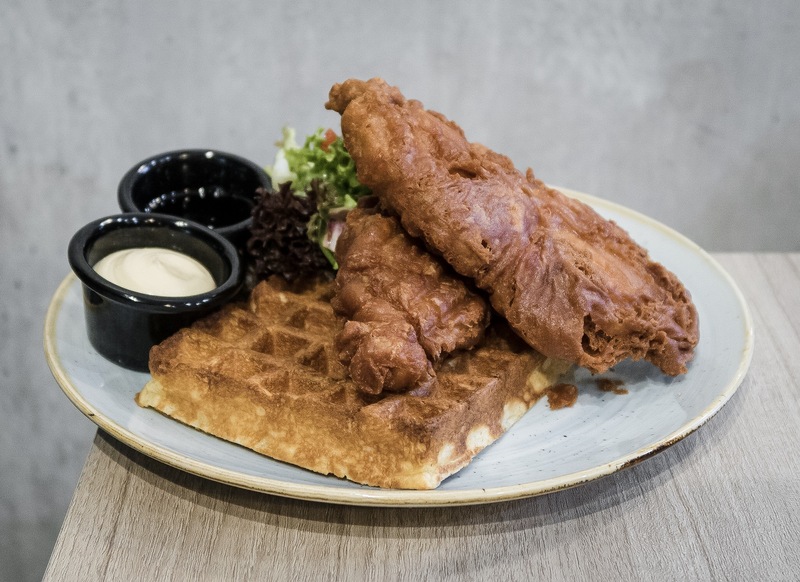 The waffles are soft and fluffy in contrast to the chicken fillet and is the perfect match. This dish comes with maple syrup and your choice of sambal mayo or plain mayo. My personal favourite is just to drizzle the maple syrup over the chicken waffles for a little sweetness. 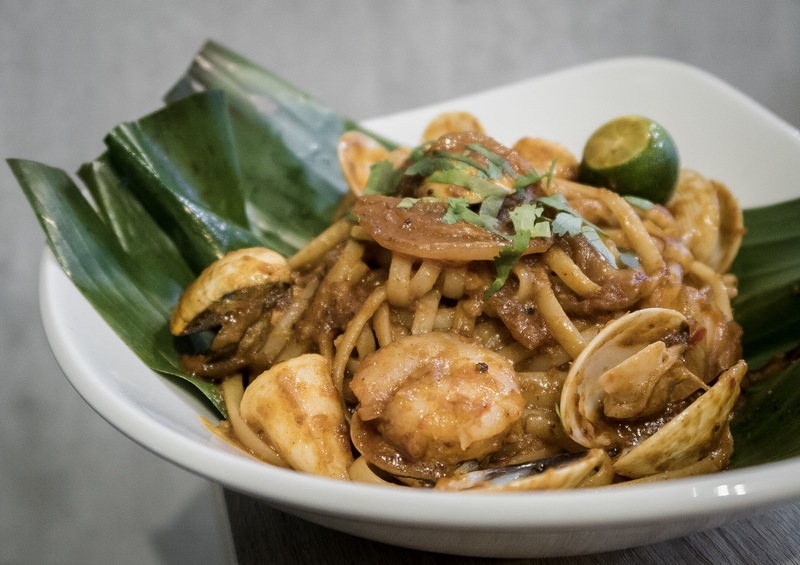 Another dish Grub has come up with to celebrate National Day, is this Sambal Seafood Pasta that is only available at Grub Bishan Park. Served with clams, prawns and squid on a banana leaf, this locally inspired National Day dish is deliciously comforting. The sambal spice level is very manageable, so if you prefer something a little spicier, you can ask the restaurant to adjust it to your liking. We tried a few other popular Grub dishes during our visit. If you enjoy your burgers, go for the Grub Double Cheeseburger ($19.80++). Layers of beef patty and bacon are stacked with melty cheese between layers and dripping down the sides. July’s special at Grub was this Mentaiko Millefeuille Katsu Burger which we enjoyed immensely. On first glance, this burger looks pretty average, but as we bit into the pork cutlet, we realised it was made from layers of thin pork slices wrapped around a center of oozy mentaiko cheese. 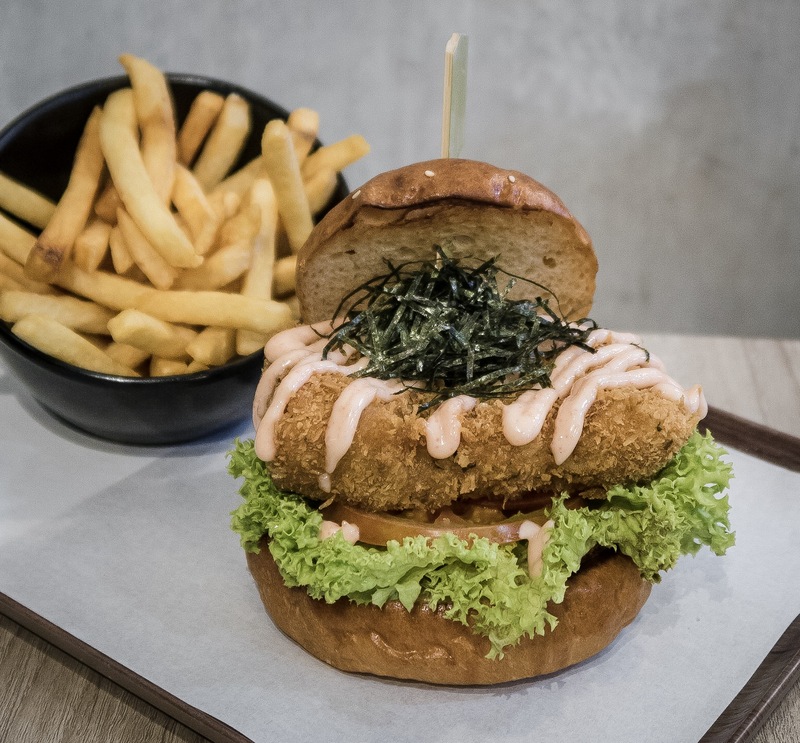 The cutlet is served on Grub’s soft brioche burger bun. 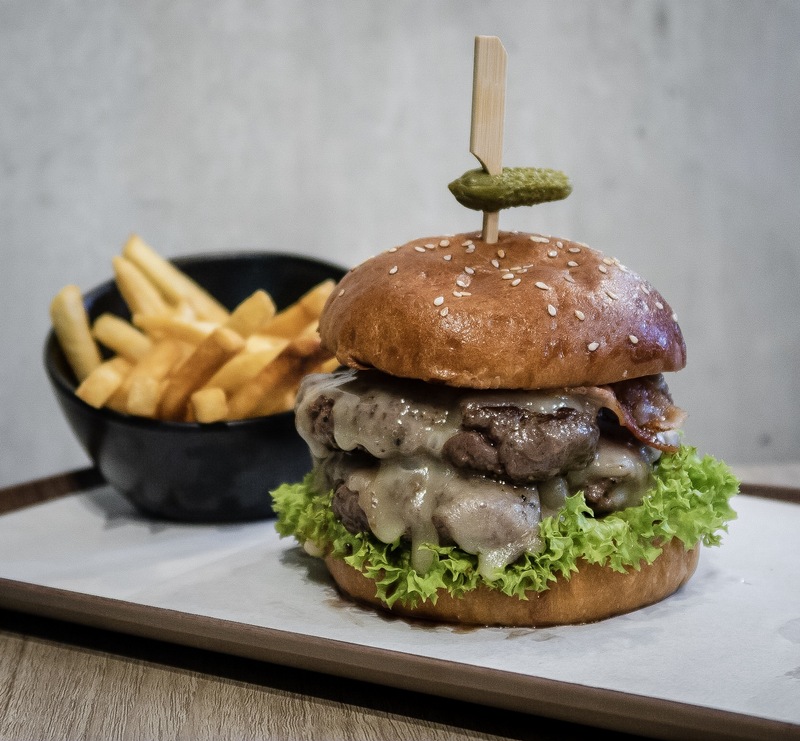 Both Grub locations are great for outings with friends and family and their menu has the perfect appetisers for sharing like with Mentaiko Fries and Truffle Floss Fries. And of course, every meal should have a sweet ending. 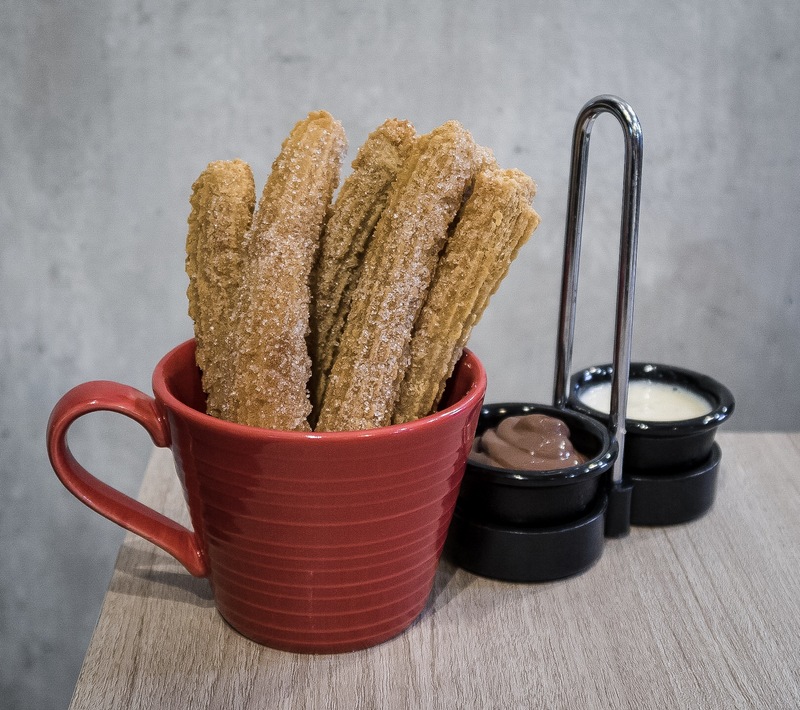 Grub offers a range of ice creams, cakes and Churros ($8.80++). Grub is open on National Day if you’re looking for somewhere to bring the family before viewing the evening fireworks.